No more crumpled, rumpled ties! The perfect solution for hanging your ties, keeping them neat and unwrinkled. Requires no batteries or installation. 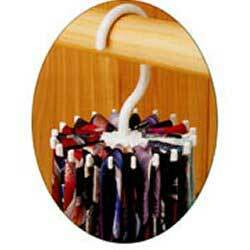 Just fill with up to 20 ties, hang in your closet and enjoy knowing your tie selection is just a twirl away!